With these jewelry making supplies, you are ready to embark on making your very first piece of handcrafted jewelry. Just buy the following jewelry making tools first and then add to these jewelry supplies as you go along. Obviously, wire cutters are for cutting wire. It is important to purchase a good quality pair of wire cutters as you will be using this jewelry supply a lot for your jewelry making. Also invest in one that is small and easy to hold yet strong since you will need to grip it in one hand so often to cut your wire while holding the jewelry piece in the other hand. Get a pair of flat-nosed pliers that is smooth on the inside of the nose. This is necessary so that you will not scratch your wire. Flat-nosed pliers are for gripping and bending wires. Buy a good pair and it will last you for a very long time. Round-nosed Pliers are used mainly for creating curls and loops on your wires. The tips of the pliers are smooth cone-shaped. Using them to make your own eye pins and jump rings is a breeze. There are longer round-nosed pliers with smaller tips which enable you to create very small eye pin's loops. These longer round-nosed pliers are necessary for making finer beads jewelry. Note: The above 3 tools are the most important jewelry making supplies. I use these three jewelry making tools for all my projects. Head Pins are "must have" in your jewelry making supplies. These are straight wires with "heads" or flat pieces on one end. These heads are to keep the beads or stones in place. You use these for earrings as well as making up drops for necklaces and bracelets. Eye Pins are sold in jewellery supplies stores. They are straight wires like head pins but with a small loop on one end. When you cut away the unwanted end, keep these aside as you will be able to use them later by making your own loop with the round-nosed pliers. Clasps like the above gold clasps are for connecting the two ends of a piece of jewelry; for example, a bracelet or necklace. There are different kinds of clasps with a wide range of designs. When buying clasps, test the clasps to see that they are easy to close and open. This jump ring has been enlarged for better viewing. You can make this jump ring using wire and your round-nosed pliers. Or you can purchase these ready made from any jewelry making supplies stores. Crimp Beads are tiny metal beads used at both ends of necklaces or bracelets to tighten wires. Contemporary beads designs also incorporate these into the design to keep the beads in place on the wire. Use the flat-nosed pliers to crimp these beads. Remember to crimp on both ends in order to sandwich the wire between. Chains are sold by the foot or as ready made chains for bracelet or necklace with clasps or toggles attached. They come in many different designs. You can also make your own chain by soldering jump rings to one another. These are beads stringing wires of different diameter sizes. Size .012 being the smallest. Popular brands are Beadalon (image above), and Accu-Flex. These wires also come in different colors. Memory Wire are very strong steel wire that can damage your good quality wire cutters. Use memory wire shears or heavy-duty cutters instead. You can purchase memory wire for bracelet or necklace. Just add your beads or stones and bend the ends to stop the beads from falling off. 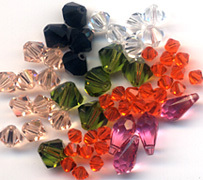 Beads and gemstones are necessary items to add to your jewelry making supplies. You will find all sizes and shapes of beads in the stores today. The ordinary beads are sold packaged in small plastic bags. But gemstones are normally sold strung on strings and knotted at the ends. Do not unstrung the stones, but rather leave them on the strings. When you need to use these, you can transfer them directly onto your beading wire. click here for more info on Swarovski crystal beads. Metal Beads are great for alternating between gemstones to give a unique look to the whole design. You will want to add some charms to your jewelry making supplies. There are lots of beautiful charms designs for your jewelry making. These beautiful designs are usually made of base-metal, and precious metals like gold and silver. So do include charms in your jewelry making supplies and use them for making your own lovely charm bracelets. 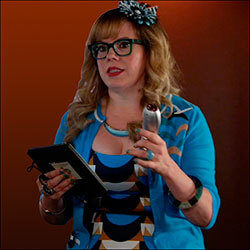 click here for more info on charms and their uses.